Travertine tile is a type of natural stone that develops over time when minerals are deposited on the earth’s surface by rivers, hot springs and geysers. For example, large deposits of travertine can be found in places such as Yellowstone Park. It is really a type of limestone, although many think of it as a form of marble. It is affordable and easy to cute compared with other types of stone, making it a popular choice for flooring and countertops. Travertine comes from the limestone family and is also commonly referred to as travertine limestone tile stone or travertine marble, though it is neither limestone nor marble. The surface area is porous, with many noticeable holes and crevices that may or may not be filled by installers. The use of travertine as a building material could date back to ancient Roman ages. The Coliseum of Rome was built with it. It is still widely used today. There are lot of vibrant options of travertine tiles available in stock at our showroom, one can choose in terms of colors, finishes and cuts. Travertine is a sedimentary stone, formed over a long period of time by minerals. It is dissolved into the ground water and then deposited onto the earth’s surface from geysers, natural springs or rivers. There are visible holes and crevices on stone surface, which installers will fill with grout. If you are going for a rustic look and feel, consider leaving travertine tile unfilled. Certain installations, such as an outdoor garden path, do not require these holes and crevices to be filled either. Travertine application areas include countertops, flooring, garden paths, paving patios, showers, wall cladding and wall coverings. The minerals found in the travertine are extremely reactive. Therefore, location and environmental should therefore be carefully considered. Sealers provide some protection, but environmental exposure will be the determining factor of whether travertine should be used of a particular project. Explore our inspiring Travertine Tile gallery and discover lot of ideas & designs with our experts help to remodel any section of your home. Tiles will vary in color due to iron compounds and other impurities. This causes color variation among individual travertine tiles and it is also the reason why this natural stone is never one solid color. Because of the color variation, no two tiles are exactly alike. The coloring for a set of travertine tile should closely match one another, with the color variation being minimal and not that visible to the eye. Travertine finishes are polished to be shiny, honed to be matte, brushed or tumbled on textured surfaces. Honed travertine marble tile surfaces are flat and smooth and they are the most common finish. Good quality travertine requires minimal polishing to make the stone shiny and reduce any holes or cervices. Brushed and tumbled travertine surfaces are flat and textured, with many holes present. Edges and corners are rough and sometimes wavy, which create an overall rough looking tile. Tumbled surfaces are the best for those who want the least amount of light reflected. Travertine tiles come in vein or crosscuts. Vein cuts are done against the bedding planes. Crosscuts are done along the bedding planes, causing a circular pattern instead of a linear pattern to the stone. Travertine Backsplash tiles come in wide range of material and style variations as light, medium and dark mixed together. You can choose Travertine subway kitchen backsplash tiles at our showroom where you find options with glass inserts also. Add Travertine Mosaic Tile for your kitchen and bathroom backsplash and other applications and give an elegant style and natural feeling to each section in your home. 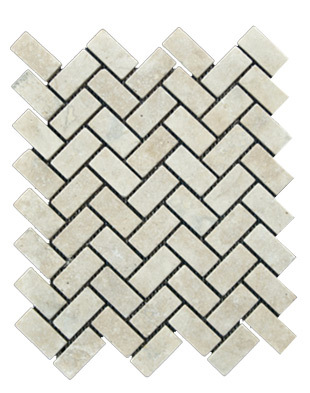 Create a travertine tile entryway for your home. Have tiles cut in repeating sizes for the main floor, and create a border in a darker shade around the floor edge. Make it single, narrow stripes just a few inches wide with a thin strip of brass or copper on each side of the stripe. Have the floors sealed to protect the metal and floors as well as to preserve the metal colors. Travertine tiles come in shades that range from brown to light ivory with natural streaks and small pock marks. Give your kitchen countertops a unique surface with travertine tiles. Choose a lighter color in a diamond arrangement for the base of your countertops and place a slightly darker shade on the backsplash in a corresponding diamond arrangement. Add a narrow vertical border between the backsplash and the countertops for a transition between the two areas. 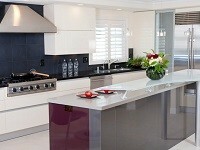 Or choose lighter and darker tiles for a variegated look. Fill the tiny holes with grout and seal the surface to guard against staining. 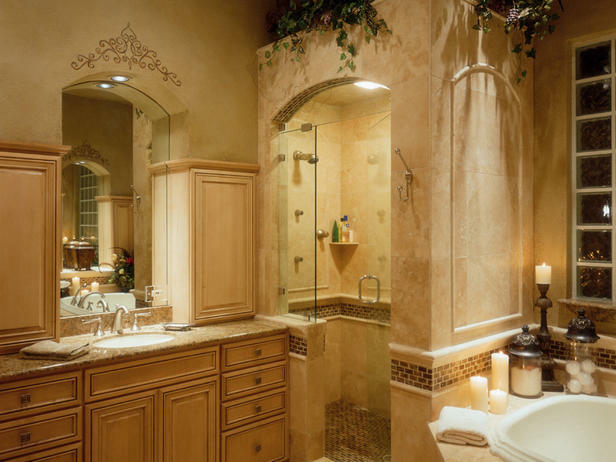 A ivory-colored travertine tile can make your bathroom feel like an ancient Mediterranean spa. If you choose a tumbled or hone-finished style, your floors and other bathroom tiles will resist staining due to its porous. Choose a variety of colors in a mix of pale coral, muted yellows and brown and combine them for your bathroom walls, floors and backsplash. Add a marble sink and a travertine light-switch cover to complete the ancient spa look. Create a travertine fireplace surround with a mixture of diamond and vertically placed tiles. You can complement with a white wooden fireplace mantel around it or a mantel of solid granite in colors. Or, create a geometric design for the fireplace surround that contrasts with a different geometric design on the mantel, and yet another design for the fireplace hearth, all of the same travertine stone. Another possibility is to build a mantel out of a amber-colored travertine tiles, and top it with a white wood mantel cover. Create a sophisticated-looking entrance to your home with a porch made of travertine tiles. Include the steps, but make them in a slightly lighter or darker color that the top of the porch for contrast. 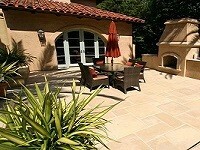 Or, consider decorative concrete, which can be dyed in travertine colors and stamped to looks like the real thing. Check our showroom where we have a lot of travertine tile collections for you to choose from. Travertine Tile mostly used in Kitchen flooring, Bathroom flooring, and other spaces. Checkout Best Design Ideas of Travertine Tile. If you are searching for the best Travertine Tile in Southern California, visit Westside tile and Stone showroom and meet our design experts to get you ideas to life.